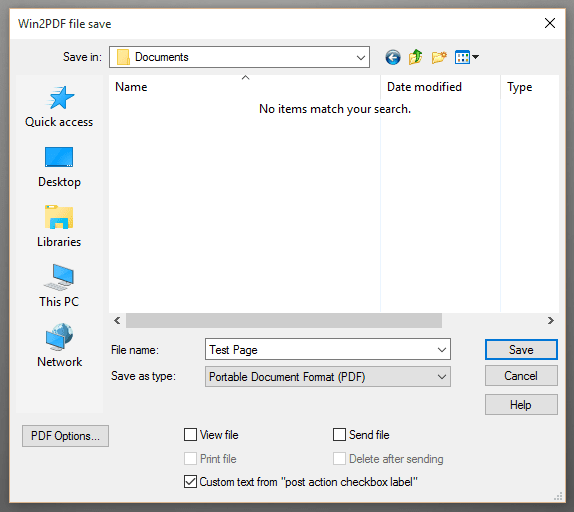 When the “post action” registry setting is set, the “post action checkbox label” setting allows an application to customize the text displayed to the user in the Win2PDF file save Window, and allows the user to selectively enable or disable the “post action” operation. The value is a type “string”, and can be up to 60 characters in length. If the checkbox is selected, the application specified by the “post action” registry setting will be launched after the PDF file has been created. If the checkbox is not selected, the PDF is created normally with no “post action” operation, even if the “post action” is set in the registry. The default value is checked, but the setting is saved and restored to the user’s last action. If the “post action checkbox label” setting is not present, the additional checkbox and label are hidden. If the application specifies a file name, the file save window is not displayed and the “post action checkbox label” has no effect. If the “post action checkbox label” is set and no “post action” value is set, the setting is ignored.